I love the meme: Be Decisive. 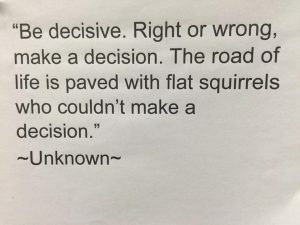 The Road of Life is Paved With A lot of Flattened Squirrels That Couldn’t Make a Decision. Ok so we aren’t talking about life or death decisions here but the consequences for failing to make decisions can be dire. I have served as an Executive Coach for nearly twenty years and in that time I have heard many candid reviews about leaders from those they lead. One of the #1 complaints? Leaders who can’t make decisions. I can assure you, if you are a leader that hems, haws and drags your feet making decisions you are causing great frustration for your team. Leadership means providing direction and order for people to do their work effectively. Part of that responsibility is making decisions that impact their priorities, resource allocation and clarity of expectations and goals. When leaders take too much time making these critical decisions, they hold up progress from every layer under them in the organization. Leaders must make decisions every day. The best leaders are transparent in their decision-making. They communicate how decisions will be made and make clear to those who report into them what levels of decision making authority and autonomy they have within their areas. Authoritative: The leader decides and then communicates a decision. This style is best for scenarios with urgent tight time frames (a crisis) or when the leader is the only person with the insight or information necessary to make the call. Wise leaders avoid overuse of this style. They know using it means risking little or no buy-in to their decision. Consultative: This style is about getting input from the team prior to a leader making a decision. A leader might begin from scratch with this style, saying “I am going to make a decision but I want your input before I do, what do you think about…?” or, “I have narrowed my decision to two options, but before I decide I want to run these two options by you to get your input.” I encourage leaders to use this style generously. Why? It allows for influence and input from others (thereby increasing buy-in, commitment and reducing risk) but keeps clarity around who is making the decision (you, the leader) intact. A word of caution: If you aren’t open to influence, don’t pretend you are. It’s a huge mistake- I have stories about how it can backfire. Be prepared to disclose your rationale for not following recommendations or suggestions and don’t take too long to make the call once you get the input. Consensus: With this style (FYI you lose your right to veto as the leader), essentially the team agrees to support the decision of the group. The plus — this often results in buy-in and commitment. The minus — trying to achieve consensus can be difficult and time-consuming. One stubborn person can hold up the process thereby creating the “tyranny” of consensus. Trying to make all team decisions by consensus is a recipe for team frustration and struggle. Consensus shouldn’t be attempted with challenging decisions that require responsiveness and timely action. Delegation: With this style, leaders give their decision-making authority away to others. This styles builds individual and team confidence/satisfaction (autonomy is a huge motivator for people) and it makes sense when someone clearly has more experience, skill and understanding required to make the call. Make sure to provide clear parameters when delegating. I frequently observe and coach team meetings and often ask the question, “Who has decision-making authority over this?” Too often, no one knows. Meetings are a tremendous investment in resources; having clarity around decision-making authority, commitment and accountability are critical to bottom-line results. For critical or complex initiatives, or if the majority of your meetings are spent wasting time, getting expert help to achieve results may be in order. A headline from The Atlantic recently caught my eye, “Why It Pays to be a Jerk”. I have counseled “jerks” in my Executive Coaching practice from time to time — I am highly skeptical about the “payoff” for being a jerk. In a nutshell, the article focused on new “success” research suggesting to get ahead “put your feet up on the table, take the last doughnut, speak first and interrupt” offering “assholes” (his words not mine) like Steve Jobs and General Patton as success models. What kind of message is this sending to the workplace? Ugh. In one research experiment, individuals violating long-standing norms (invading personal space, claiming undo credit or taking the last cookie) were seen by viewers as someone they would see as a boss or worthy of being “put in charge” over those acting “normal.” Academics name this “prestige” factor – from cavemen days to today, we are more apt to follow leaders who think can provide what we need —build a better fire, kill game or fight off threats. In workplaces, we want a leader to get us what we need to succeed–resources and providing protection from threats (think competitive advantage or other senior leaders roadblocking your important project). Back to the experiment– someone who helps the team gain resources is viewed positively even if (sadly) they behave like a jerk to get it. I must admit this resonates with some of my client experience–leaders often send messages to staff that its OK to be a jerk if doing so improves the bottom line. For example, take performance reviews–I see many that are contradictory around “jerk” behavior. An individual is reprimanded about behavior that upsets peers but applauded for their ability to drive projects forward. Leaders need to be seen as capable of driving change and taking a position but never in a toxic way. There is a big difference. In my coaching practice, professionals seen as critical contributors are often “sent” to me for coaching and counseling about how to drive action without offending people. I am brought in to help them tone down their dysfunctional or problematic behaviors and learn skills in persuasion, conflict resolution and negotiating to get results but without offending everyone in the room. C suite wannabes also need to monitor overdone people pleasing ways. Amy Schumer’s viral video of women constantly saying, “I’m sorry” is a wake up call for professional women. How we behave in workplaces adds up to how we are perceived by others. Constantly accommodating, acquiescing and deferring can negatively impact whether or not people will want you as their leader just like acting like a jerk can. My take on the “Be a jerk” headline-context matters greatly. There are times when taking a difficult stand, interrupting a droning peer (you may get applause for this act) or making a tough decision like laying off the office problem person (even if they are a star performer) is the right answer. But how you do it is critical–these leadership challenges are the crux of many of my coaching conversations. Watch how your behaviors impact peers–seek feedback and get a 360 review if you haven’t had one done. The one I use with clients is 100% confidential and is designed for leadership development. My clients regularly walk away from my 360 review sessions with vital new feedback that helps them become more successful leaders. If you are a leader or manager seeking to improve or move upward–you simply can’t afford not to know how co-workers, reports and superiors perceive you. One final thought –jerk behaviors viewed as offensive, abusive or toxic will lead you only one place—out the door. Building trust on teams is critical. Egos, turf guarding, dysfunction and game playing are too often the norm in organizations. Some professionals are absolute information hoarders failing to keep their peers informed or updated by information that could help them succeed. In his new book “Team of Teams” retired four star General Stan McChrystal (he led army forces against Al Qaeda in Iraq) promotes “radical transparency” for teams. McChrystal said to meet the challenges in Iraq he needed his disciplined military network to adapt and pass information quickly. This is also required of most organizations to thrive in a complex ever changing business environment. Another McChrystal concept I applaud is his “shared consciousness” for teams with decentralized management where people are empowered to execute with their own “good judgment.” I’m reminded of my favorite example of an employee handbook: Nordstrom’s sums theirs up in one sentence, “Use your best judgment in all situations.” But getting teams to the point where they think and act like a team isn’t easy. Many are bogged down with dysfunctional behavior–sometimes unconsciously emanating from the leader. I firmly believe that if you have hired the right person and they are committed to do a good job–arm them with the resources, support they need to be successful and let them do their jobs. Part of that support from leaders is arming them with the information and the contextual understanding they need to succeed. Another is taking the “dysfunction” out of their teams which is often the most difficult perplexing and frustrating part of any leaders role. I am here to help leaders with their people issues – I take the “dysfunction” out of teams! This is the season for retreats – I can help facilitate your sessions for increased engagements and less game playing!